We bought this S&H Ford Gran Torino from Scott T. in Ohio in August of 2000, and it's been on this web site ever since then. These new pictures, taken at various car shows in 2006, are pretty much the first ones I've put on the site that really show the car's new wheels, tires, engine, and other minor changes it's undergone in the last year or two. In May of 2005, we traded in this car's old Goodyear HR78x14 Bias Ply tires for some modern Goodyear Eagle GT IIs. The old tires looked great (they were over 20 years old and came off another S&H Torino) but they were terrible on the highway, and we do a lot of long-distance highway driving. The new tires give us a much, much more comfortable and safe ride. I mounted the tires with the white letters facing out just for fun, and I can always turn them around if I care to. I chose the Eagle GT IIs partially because of the way their sidewalls look. I didn't want too much writing and designs on my tires. I also wanted to stay close to a "stock" size tire, so I didn't put wider tires in the back like most people do. My rear tires are 235/70/R15 and the fronts are 235/60/15. The rear tires are a couple of inches taller than the fronts, giving the car a little rake, and they fill up the wheel opening nicely. I also have Torino station wagon springs in the back, which give the car about an inch of lift. I do not have air shocks. 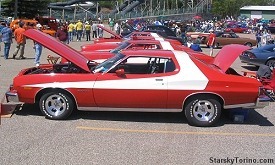 The old wheels on the car were great-looking vintage aluminum slotted mags, but all four were 14 inch wheels. Because modern tire sizes and structure are different than the old ones, I couldn't get 14 inch tires with a tall enough sidewall to look good on the rear of the car, so I was forced to retire the vintage mags and get new 15 inch ones. These are brand new replica slotted mags, and they do not look very "authentic" up close, but a very, very nice guy made me an deal on them that I couldn't possibly refuse. It didn't take long to get used to them, and they look very good on the car. Although other sizes are available, all four of my wheels are 15" x 8". 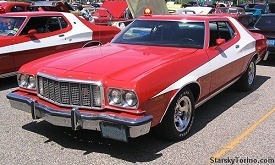 When we bought this car, it had a woodgrain dash piece around the instruments, which was not stock but looked very nice. 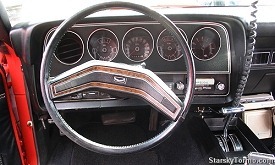 It matched the woodgrain in center of the leather-wrapped steering wheel, which IS original on this car. But in 2005, I replaced the woodgrain piece with the standard black piece just for fun. I can always switch them again if I feel like it. In August of 2006, I added an aftermarket Cruise Control unit to the car, and it works fantastic! It's an Audiovox CCS100 available for only $90 from Amazon.com. 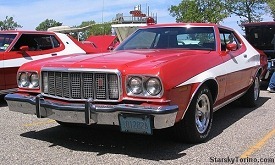 I installed it myself, and I highly recommend it to anyone who drives their Torino any sort of distance. Did I say it's fantastic? It is. As you can see, I removed the right-hand mirror control and put it under the dash (it doesn't work very well, so I hardly ever use it) and I put the cruise control's buttons where the mirror control was so I didn't have to cut any holes in the dash. The controls are right at my fingertips. 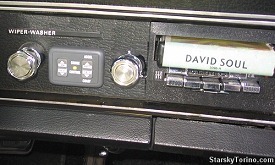 Our car was ordered with an AM/FM Radio and 8-Track player, but unfortunately some previous owner cut the dash all apart to put in a modern radio. As soon as we bought the car, I bought an AM/FM 8-Track player on eBay and installed it. It works fine, but when we're on the road we prefer to listen to CDs on a portable CD player (or MP3s on my PDA) with a tiny FM transmitter attached to it, which then is picked up by the radio and plays through the car's speakers. 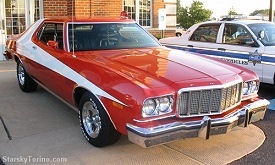 When we bought the car, it had a 351 W 2 bbl engine in it that came from a 1974 Gran Torino which also donated other parts to our car when Scott rebuilt it (our car had an engine fire sometime in its past and the front end was burned up). That engine ran great but developed a rear main seal leak that couldn't be plugged. Fortunately, Scott had given us this car's original (numbers matching) engine block when we bought the car from him, so in 2003 we had that block rebuilt by Gopher Engines in Minnesota and had it installed by our favorite local mechanics. While the engine was out, I cleaned and painted the engine compartment and all the miscellaneous pieces and parts that were transferred from the old engine to the new one. 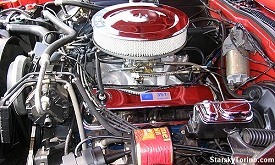 In August of 2006, I got all mechanical and replaced the engine's stock intake and 2 bbl carb with an aluminum performance intake and 4 bbl carb. It's the biggest mechanical project I've ever tackled by myself, but thanks to a lot of advice and encouragement from good friends Jim W. and Joe W., the project went very smoothly and the car has much more power than before. So now the engine and everything connected to it is new (less than 3 years old) except the radiator, the air conditioning stuff (which doesn't work anyway - yet), and the power steering pump. We've had a lot of great adventures with this car. Someday I plan to add a map to this page which will show all the places in the USA we've driven the car to. Read about our Coast to Coast Trips! Since we bought our first S&H Torino in 1998, we've been involved with the development of the S&H Video Game, Ertl's 1/18th Scale Die-Cast Torinos, and the 2004 S&H Movie. 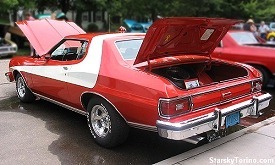 We've traveled thousands of miles through dozens of states and met many, many wonderful people, including dozens and dozens of other S&H Torino owners. It's been a lot of fun, and we look forward to a lot more of it!